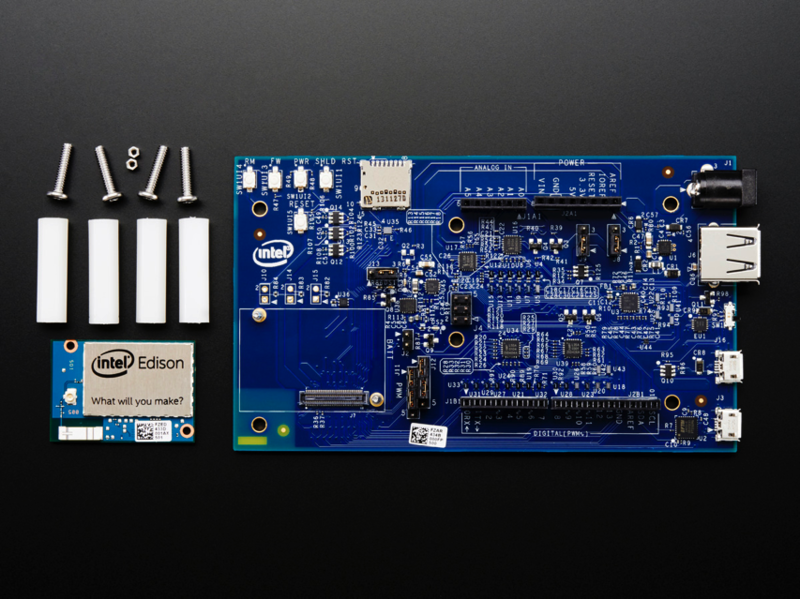 NEW PRODUCTS – Intel® Edison Kit w/ Arduino Breakout Board / Intel® Edison w/ Mini Breakout Board / Intel® Edison Compute Module « Adafruit Industries – Makers, hackers, artists, designers and engineers! The Intel® Edison kit for Arduino is a compact computing platform that’s small by design so you can easily integrate it into projects. It’s primarily designed for “Internet of Things” projects and is pretty powerful for its small size. The board supports 40 GPIOs and includes 1 GB LPDDR3, 4 GB EMMC, and has dual-band WiFI and BTLE. However, to get to all those pins can be a hassle without a breakout board. That’s why we have this kit! The Edison kit for Arduino comes with a breakout board that supports Arduino Sketch, Linux, Wi-Fi, and Bluetooth. Best of all, it’s mostly-compatible with the Arduino Uno layout (with 4 PWM instead of 6 PWM) so you can connect your Arduino breakout boards onto the Intel board to interact with the Edison. This Intel Arduino breakout also has an SD card connector, micro USB or standard sized USB-A connector, 6 analog inputs, and 20 ditial input/output pins, 1x UART, 1x I2C, and 1x ICSP 6-pin header (SPI) Power with 7V-15V DC input and you’re ready to play with the Edison! The tiny Edison fits nicely onto a breakout board – sort of like a tiny IoT sparrow into a very small nest – so you can expose the native 1.8 V I/O of the Edison. The breakout board has a power supply, USB serial, USB OTG port and power switch, an I/O header, and a battery charger. Together, there’s seamless device-to-device and device-to-cloud communication. 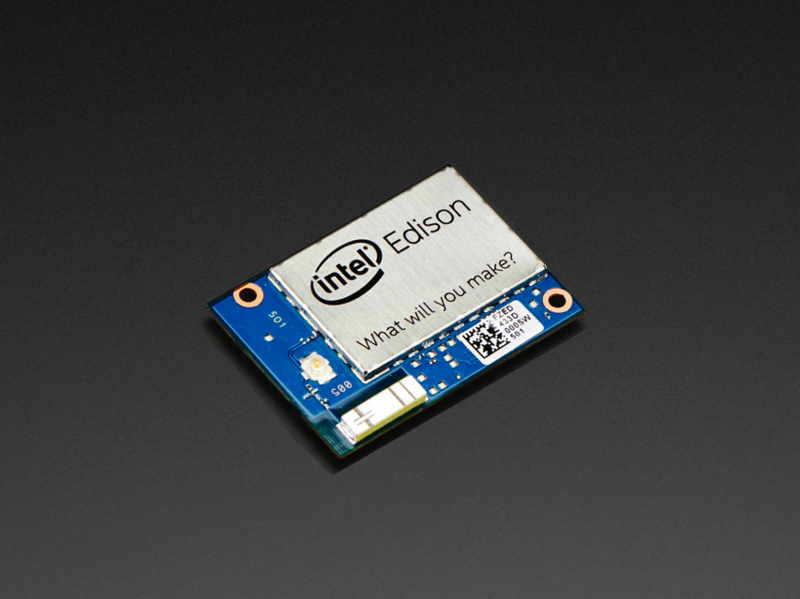 This is just the Intel Edison Board – the connector is really small and you cannot hook up wires to it easily! The Intel Edison Arduino IDE will not compile the Adafruit bicolor8x8 Matrix sketch for the Adafruit_LEDBackpack.cpp. I get a “pgm_read_word not declared in this scope” error. BTW it does compile with the standard Arduino IDE. 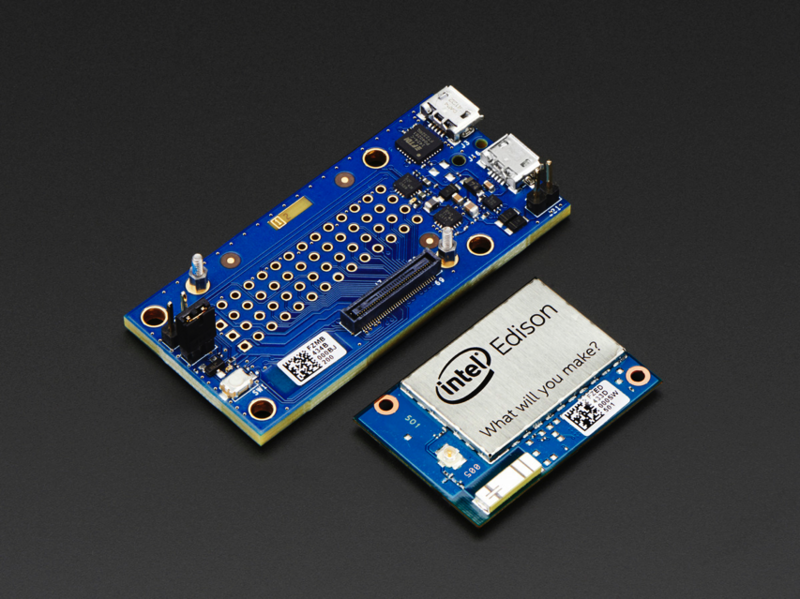 The standard Arduino IDE will not work with the new Intel Edison Arduino however.